Title Card: In 1965, the FBI seized and destroyed the Zzyzx complex for "unspeakable atrocities" by cult leaders Carl and Sophia Ziller. 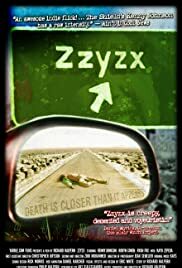 Q: Where does the real Zzyzx Rd. lead to? Saw this Z movie at a festival in Miami. It spooked the crap out of me! I like movies that have surprises and this one so did. Kenny j's awesome, BTW! It starts out with these Mexicans finding bones in the desert, then goes on from there. Kenny plays Lou, a handsome but kinda crazy guy whose taking this sorta dweeby Ryan character to Las Vegas. They stop off on Z road (sorry, can't spell it without looking) and stuff happens out there that I don't want to say cause it would spoil it. Trust me, don't read any comments that have spoilers. You'll really like the twists if you don't know their coming. They meet a couple more people on the road, one is Candace, who wears pretty funky clothes. Better quit before I blow anything. Check it out. Can't wait for the DVD.